Welcome to the first ever Enduro GP of Great Britain, organised by the Fast Eddy Racing team at the World famous Hawkstone Park circuit. The format has neverbeen seen before at World Enduro level. It will have riders from GP Motocross, Traditional Enduro and Extreme, the World’s best up and coming Junior and Youth riders too. 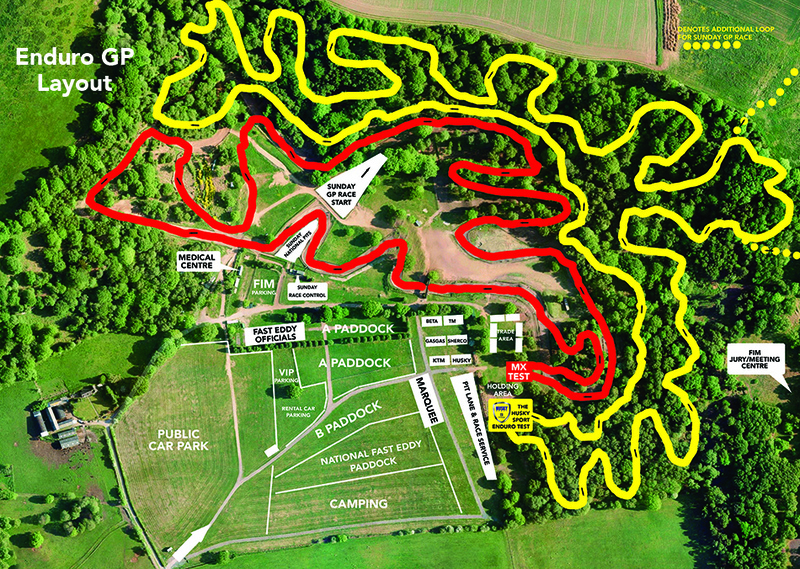 Most riders have their preferred upbringing or discipline but this weekend we will see them all go head-to-head on the famous Hawkstone Hill MX course and surrounding woodland with difficult climbs and descents in the woods and the sandy tracks and all that this famous venue has to offer. Friday will be a ‘free day’ for all with open paddock so everyone can see the big team trucks, riders, technical inspection and track inspection. Saturday will then be the first day of action with two special stages; Test 1 will be the MX test which will see the top Enduro GP and E2 riders take a sighting lap followed by six individual timed laps from 10.00 am onwards. Each following lap will see the fastest rider from the previous lap on track first followed by the second fastest and so on. Test 2 is called the Enduro Test and will follow the same format at the same time for the Enduro Junior and Youth classes. After each of the six tests are completed the riders will change tests and get a single sighting lap in readiness for a further six timed laps. The day will end at approximately 4.00 pm for all to enjoy a relaxed evening while the team mechanics work their magic late in to the night. Sunday’s action will begin with a Fast Eddy National 2-hour race at 9.00am with 150 riders getting the unique opportunity to test their skills on the very same tracks of the Enduro GP riders from the day before. The main race will begin at 12.00 midday for a full three hours with each class lined up on the MX start straight for a dead engine start. First row will be the top Enduro GP riders with row two, the E2 class, starting 1 minute behind. One minute gap again and the third row will be the Enduro Junior class. Last away (but certainly not least) will be the Enduro Youth. Each rider will have to make TWO mandatory pit stops for fuel during the three hour challenge so the weekend is all go right from Friday onwards. Add to all the race action why not grab a bargain from Trade stands, enjoy the Saturday evening marquee and band making the Enduro GP of Hawkstone an event not to be missed! A full weekend of entertainment for all the family regardless if you’re a fan of MX, Traditional Enduro, Extreme or just a two-wheel enthusiast.